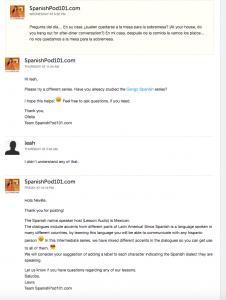 Spanish pod101 is designed in such a way that you do not need to attend classes on a specific schedule, and that is one of its great advantages. But, what if you want to interact with the teacher or your fellow students? Well, Spanishpod101 has thought about this too. Under every Spanish lesson you will find a box for “comments”. Here you can ask questions, make comments about your Spanish lesson, inquire about doubts or ask for more tips or resources. You will receive a timely answer from the teacher solving your doubts or providing tips. Of course, you will also be able to read comments from other students and learn from them or even try to help them out if you think you can. They will also be able to react to your comments and leave feedback. This way, you will be able to follow a thread or answer any of the older comments. 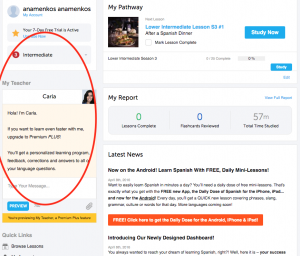 If you prefer to interact with your Spanish teacher on a one-to-one level, Spanishpod101 offers a great new option: My Teacher app. You can learn more about your Spanish teacher and how to contact them on the left-hand-side of your screen. This is a feature that is available only to the Premium Plus users, a version that I strongly recommend. If you are highly motivated to learn Spanish at a faster pace and need to practice specific phrases or content, this is the option for you. You can get a 35% discount on Premium Plus on Spanish Pod 101 by clicking here. 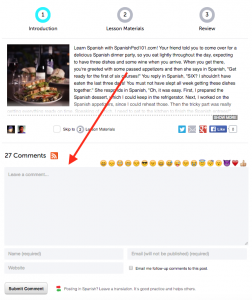 Spanishpod101 My Teacher app will allow you direct and constant communication with your online Spanish teacher. Download it directly to your mobile device and start learning in minutes. You will be able to ask questions, improve your pronunciation skills, get personalized assignments to improve writing and reading, and you will also receive constant feedback and a dose of motivation through the Achievement Badges you will unlock after completing your Spanish assignments.